We’re so excited you’re interested in having Blue Cloud Farm flowers featured at your wedding! Using seasonal and local flowers at your celebration is a perfect way to reflect the time of year and place you've chosen to get married. Working with the freshest flowers and foliage from our fields, our arrangements showcase the unique beauty and ephemeral nature of each specific moment in the season. We love working with couples who entrust us with bringing their floral visions to life! It is an honor to create for your wedding using the best of the flowers and foliage growing at the time of year you’re getting married. After learning more about your style and aesthetic for your day, we build you a custom quote based on what we have discussed. Because we use mostly seasonal flowers in our design work, and each season presents different growing challenges, we are not able to absolutely guarantee certain varieties will be available for a specific date. 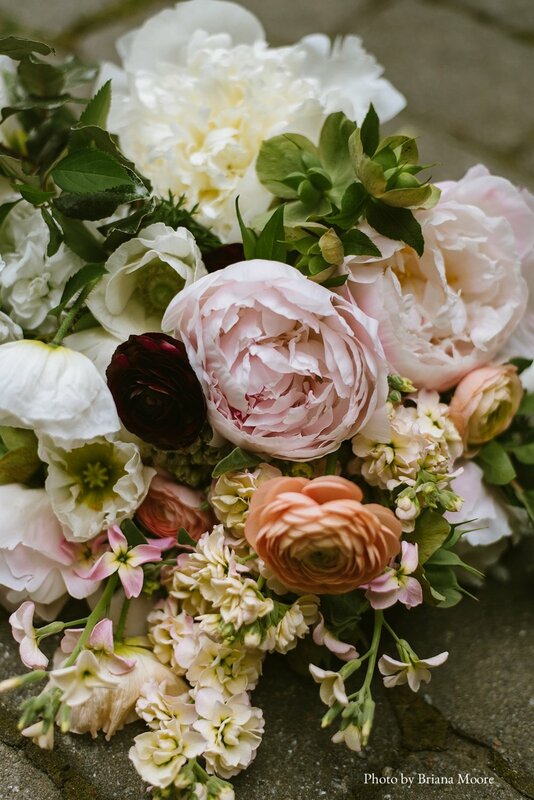 We can, however, commit to providing you gorgeous florals in a specified color palette and style. If you are interested in starting the discussion about having us flower your wedding, please get in touch with Kim at bluecloudfarm@gmail.com or via the contact form below. The flower/foliage bucket option is a mix of different types of the best-looking flowers and foliage from our fields the week of your wedding. These buckets are a good option if you have flexibility on exactly what types of flowers are in your arrangements. The buckets will include a mix of focal flowers, as well as small to medium sized blooms, and complimentary foliage. This is a combination of the above two options. Many couples have family and friends that are interested in putting together their table arrangements, for example, but may be intimidated at the task of making bridal bouquets, corsages, etc. We regularly create personal flowers for couples who pick up buckets of cut flowers from us to put together their own arrangements. If this is an option that interests you, please let us know! We look forward to hearing from you about your wedding flowers! Thanks so much for your inquiry! We will be back in touch soon! Blue Cloud Farm is a sustainable flower farm in Coastal Maine offering seasonal floral design, wedding flowers and event flowers.